Join us in congratulating Lowe’s Home Improvement as April’s Logan County Chamber Business & Entrepreneur of the Month. Lowe’s of Bellefontaine was recently recognized as an “SSEI Divisional Award Winner” an award based on sales and service employee incentives. There are only 2 stores out of 600 in each of the three divisions recognized for this award each year. 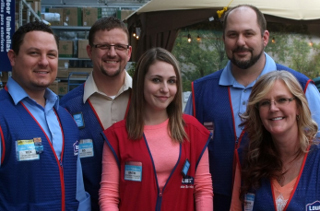 In 2015 our local Lowe’s was awarded “Store of the Month” three times within their market and once in their 121 store region. They were also awarded a Gold Star for employee engagement. In addition to these sales and service awards, the Lowe’s employees are very involved in the community with projects such as the Logan County Human Society’s Vets Trailer (Heroes Project) and the ongoing partnerships with Boy Scouts and Girl Scouts of America, Habitat for Humanity and Doors of Encouragement. Lowe’s has also given back to our community through the Lowe’s Charitable & Educational Foundation’s Toolbox for Education grant; a grant awarded to teacher-parent groups in the public schools. Logan County Chamber of Commerce would like to recognize Nick Kleinhenz for his dedication and commitment to this community and to the Chamber. 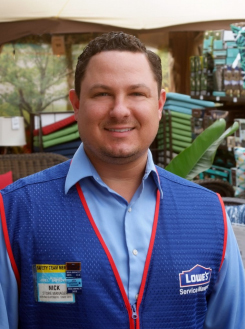 We congratulate Lowe’s Home Improvement and the entire staff on being April’s Business and Entrepreneur of the Month!